Are you still vexing what present is perfect in most gift occasions? No more Vexing! Here is the answer - NearMoon 5 in 1 Wine Bottle Opener is your excellent choice! 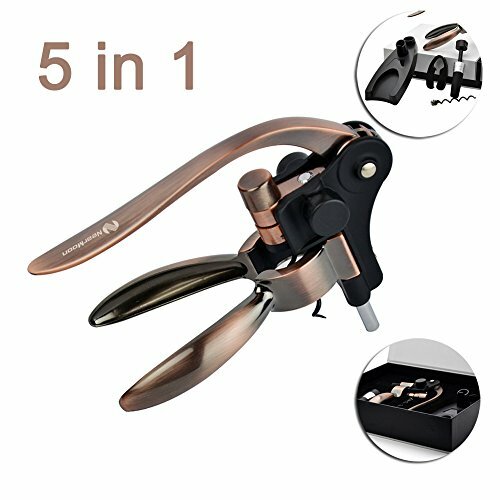 Birthday, Wedding, Anniversary, Award Ceremony, Christmas Day, Monther's Day, Father's Day, Thanksgiving Day, any celebration and festivity you can think of, our wine opener can satisfied your demand. Do you sometimes feel whiny that can't find suitable tools when you want to open a bottle of wine? Don't worry again! NearMoon 5 in 1 Wine Bottle Opener Set has considered for you! You will no more worry about hurting your finger to tear the foil seal. You don't need to spend that much effort to pull out the cork anymore. You will never worry about the rest of your wine being souring. And the white fashionable gift box or the stand act as a perfect storage. Do you always waste time to opener your wine with the traditional wine opener? Never mind! The ergonomically friendly-use Wine Bottle Opener by NearMoon help you saving time from now on! Only few seconds is spent to open your wine bottle. Let you experience the high-efficiency way with your wine. AMAZING GIFT BOX SET - Including 1* Wine Opener, 1*Stand, 1*Foil Cutter, 1*Vacuum Sealed Stopper, 1* Extra Corkscrew Spiral. Absolutely with the user manual and fine upscale white fashionable box. It's really a best choice no matter for private use or as birthday gift, wedding gift, Anniversary, Award Ceremony, Christmas present and any occasions for giving gifts. SOLID AND DURABLE ZINC ALLOY - The main material is high quality zinc alloy plated which makes the bottle opener is smooth and sleek. The plastics part is made with food-grade PC and silicone to protect users health. Premium stainless steel prevents rusting and keeps long using life. Any wine enthusiasts should not miss such a high quality and ideal goods. ERGONOMICALLY STRUCTURE - The ears design based on the leveraged. You can hold the hand shank easily and comfortably. When the other hand's pressure is effected on the end of the grip handle, the power will be multiplied at the corkscrew, which helps opening the bottle with fluent motion in 5 seconds. REASONABLE AND CONSIDERATE PACKAGE - The 5 in 1 combination fully consider every step when people open a wine bottle. Using the foil cutter remove the bottle foil seal  Using the wine bottle opener take the cork out  Using the vacuum sealed stopper pump out the air and storage. All the tools can be placed on the stand liked a pleasing art when not using. An extra corkscrew spiral is for back up. LIFETIME WARRANTY AND 90 DAYS REFUND - We regard every customer as valued friends. Please no hesitate to contact us to get a new one or full refund if any problem come out in 90 days. And we provide the lifetime warranty with no ask. We try our best to protect every customer's investment to ensure the worry-free shopping. If you have any questions about this product by NearMoon, contact us by completing and submitting the form below. If you are looking for a specif part number, please include it with your message.